Our Mother, Grandmother, Great-Grandmother and Great-Great-Grandmother, Evelyn Cutler Nalder, 98, passed away April 11, 2019, at the Oneida County Long Term Care. Evelyn was born July 3rd, 1920 In Snowville, Utah, to Newel J. Cutler and Floy Ivy Bingham, the oldest of five children. 3 Brothers and 1 Sister joined the family. In 1928, Evelyn’s dad received a call to preside as president over the Tongan Mission. The family lived in the Tonga Islands for four years, returning to Holbrook in 1932 due to a serious illness to Evelyn’s mother. While living in Tonga Islands she attended school there and learned to speak the Tongan Language. She found it difficult to speak English for a while when she returned to the United States. Evelyn enrolled in school at Holbrook which was quite an adjustment. Since she had spoken the Tongan language for four years, she would have to translate in her mind everything said in English to Tongan. After graduating from eighth grade, Evelyn moved to Logan and attended her first year of high school. She returned to Holbrook and continued her schooling at Malad High School, graduating in 1939. Following graduation, she moved to Ogden and went to business college for six months. It was about this time that she was also chosen as queen for the Malad Stake Gold and Green Ball. Vernal Nalder and Evelyn Cutler met and began their life together with their marriage in the Logan LDS Temple. They were married July 10th, 1941. They raised 3 sons and 2 daughters. They lived their entire life in Holbrook, Idaho where they farmed and raised cattle. Evelyn served as ward librarian for many years and as a teacher in the Sunday School, Primary, and Relief Society Presidencies of the ward. Evelyn worked as the postmaster for the Holbrook post office for 29 years, from 1955 to 1984.” A woman ahead of her time.” quoted by her niece, Myrna Harris. She also supported her grandsons who each served a mission for the Church of Jesus Christ of Latter-day Saints. Evelyn served a mission in the Alabama Birmingham Mission for the LDS Church, an experience which has been a great blessing to her and to her family at home. She entered the MTC in Provo on April 30, 1986 and returned home in May of 1987. 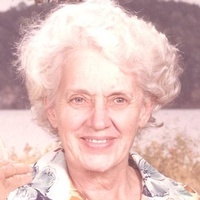 Evelyn is survived by sons Larry C. (Bernice) Nalder, Holbrook, ID. Dallan A. (Cindy) Nalder, Holbrook, ID and daughters, Darla N. (Joe) Anderson, Idaho Falls, ID and Deann (Sherman) Barker, Pocatello, ID. A daughter-in-law, Nancy Nalder, Brigham City, UT. A brother, Newel B. (Glenna) Cutler, Bear River City, UT and sister-in-law Peggy Craig Cutler, Salt Lake City, UT. Also 26 grandchildren, 65+ great-grandchildren and 12 great-great-grandchildren and many nieces and nephews. Preceded in death is her husband Vernal W. Nalder, her son Vernal Lynn Nalder, brothers Odell B. (Ellen) Cutler and Reo B. (Peggy) Cutler, her sister Diana (Norman) Harris. Her parents Newel J. Cutler & Floy Ivy Bingham, also three grandsons. Funeral services will be held on Friday, April 19 at 1 p.m. in the Holbrook LDS Chapel. Friends may visit with the family on Thursday evening from 7-8 p.m. at the Horsley Funeral Home, 132 West 300 North and Friday from 11:30-12:30 at the church prior to the service. Burial will follow in the Holbrook Cemetery.